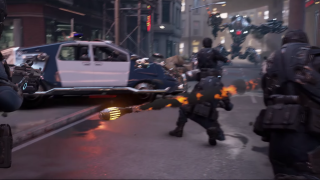 The slow-motion projectile at the start of this trailer makes me think of early 3D movies like Spy Kids 3D, which I saw in the cinema, and the way they'd have a higher than average amount of things coming towards the camera. This demo, called "Showdown", represents how Epic Games thinks it's best to show off what VR can do: a fight with a giant mech, with cars and shattered glass and sparks all flying towards the viewer. If you have an Oculus DK2 or better, or somehow have access to an HTC Vive, you can download the interactive demo through the Epic Games launcher (on the Learn tab). According to Epic, the demo also comes with its full content library for Unreal Engine 4. If you're really interested in how these kinds of things get made, you can also watch the team talk about that on Twitch at 7pm tonight.